It has been one of the busiest weeks ever.. There just aren’t enough hours during the day to get everything done, so it’s all about the hearty breakfasts for the early birds these days.. In a saucepan heat the berries and the powdered sugar. Cook over medium heat until they soften up and release their juices. Set aside and let it cool. In a bowl, mix the fromage frais and the honey until smooth and set aside. 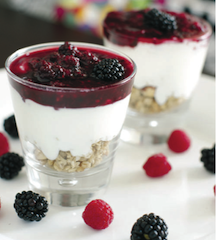 Fill the cup 1/3 with granola, then add the yoghurt, and top with the berry coulis.